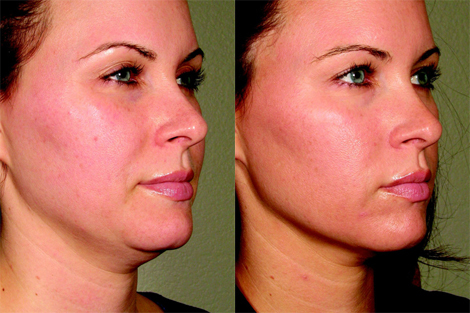 Turkey neck is the term used to refer to the lax skin that hangs under the chin. It resembles the neck of the turkey, hence the name. "Turkey Neck" occurs because of lack of support from the muscles of the neck to the skin. Loss of elasticity in the skin due to ageing results in skin sagging which causes the neck to resemble that of a turkey. It can also be caused by an extreme fluctuation in weight. How can turkey neck be treated? Nefertiti Neck Lift: For nearly 700 years, Nefertiti has been the inspiration for women wanting a swan-like, youthful neck. As we age, the platysma (a thin fan of muscle that spreads from the chest up the neck and to the jaw separates into rope-like bands, creating a turkey neck. This treatment involves 20 to 40 small doses of Botox injected into the platysmal bands in the neck, lower jaw as well as the muscles that pull the corners of the mouth downwards. This enables the lifting muscles to work unopposed, creating a firmer jaw and a smoother neck. Results are typically evident within one week following treatment and can last for up to four months. Education on neck exercises to prevent or help turkey neck. Such exercises will make neck muscles stronger and support the skin for a longer period of time. Profhilo injections for hydration and building collagen.